Dennis Wingo Lunar Orbiter Status, January 31, 2014. Another productive day. Started out with W1-030 and ended with W1-049. That puts us more than half way through Woomera for LO-I! Quite a run of tapes today, twenty in all! If I can do this every day, which is what I was hoping to be able to do, I can finish the Woomera captures and start on Goldstone this coming week. Dennis Wingo Status, January 30, 2014, end of day. Been a good day today! Finishing up tape W1-029 right now. This makes 16 tapes today. I finally figured out a system when capturing the medium resolution images and verifying that we are not missing a good high res image. I also figured out how to keep track of the frame lets for each medium res image and a way to enter it into one of our spreadsheets in a way that will make Austin happy. Here are the tapes and images captured today. Just a short status as the LO-I tapes take a lot of time and effort. Getting a handle on finding where the medium resolution image actually is on a tape. Not as easy as it could be as the document that we have used very successfully on the other missions does not exist for LO-I. I am basically taking the sequence numbers from the tape and finding where that sequence number was captured and then noting the frame let numbers for a medium resolution image. After looking at the first frame let of the tape I can figure out where the medium resolution image is on the tape with some guessing and playback effort. So far we are on W1-012 today. This brings the total left to go down to 275. Well, we have quasi completed Lunar Orbiter IV! I state it as quasi as we have found three additional tapes that will not play, no matter which head we use. It is our speculation that after a head was changed at the Madrid ground station that tapes M4-(53-55) somehow had a bad calibration that ended up with a bad recording. We speculate on this as tape M4-056 works just fine and there is no way that if the problem was related to an old vs new head that this would have happened. Anyway we played tapes M4-(57-60) and tapes M4-(66-79) today. We are missing tapes 80 and 81 so we are done, that is until cleanup after we finish LO-I. We still want to go back and try these tapes again but for now we are done with LO-IV! The tapes from 66-79 were all from the bad part of the spacecraft downlink where they were having problems so we did not get too much good stuff there, other than some gap filling to flesh out some missing frame lets in medium resolution images. I will put out the tapes vs images in a follow on post. Here is an image of the first tape from Lunar Orbiter 1 sitting on the FR-900! Away we go! Made good progress today, made it through M4-110 then backed up and started with M4-061. Made it through M4-065 at the end of the day. This gets us down to 310 tapes to go! (We are going to have a last tape party when we get to the end of the road here). I forgot to put out a status yesterday as I had to run out to San Francisco to a meet up yesterday. Yesterday we made it through M4-102 and things look pretty good today as I am through M4-109 (slept through rush hour this morning after a late night last night). I am running M4-110 now and after my capture of M4-111 last week this finishes the numerical series. However, we still have M4-53 through M4-079 to complete. 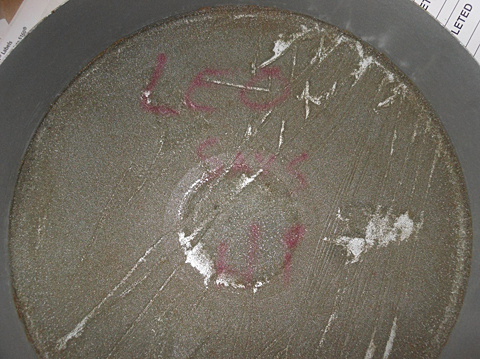 Some bad news is that we are missing two additional Madrid tapes from LO-IV, M4-080 and M4-081. This brings us to a total of six LO-IV Madrid tapes that are missing and this is by far the most missing tapes that we have for any mission. Very sad about this as we are getting some really nice images, as we see with the honor of the Wired image of the day today for LO-IV-123M! I should have time today to go back and see how many in the 53-79 series that I can get. Another annoyance is that most of the tapes I have today are from the two pages that are missing from the table from the book we just got so I can’t even tell you what images we have from today’s captures. Here is what we got yesterday. 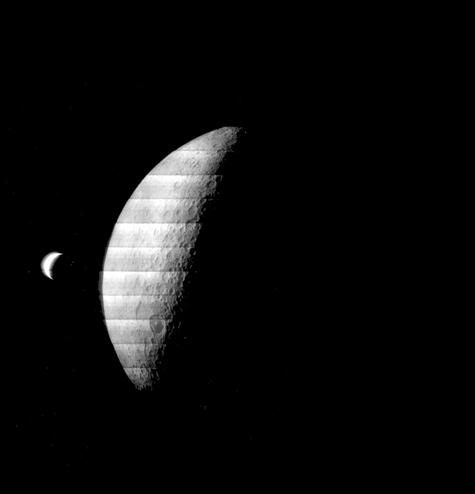 That’s all that I have data on…..
Adam Mann (@adamspacemann) at @wiredspacephoto and @wiredscience was nice enough to tweet a link to our Lunar Orbiter IV earthrise image to over a million followers as the WIred’s Space Photo of the day – thanks, Adam! See: Another Lunar Orbiter Earthrise Retrieved and Enhanced for more information on the recent recovery and enhancement of this image. Looks like we are able to move forward. The head that we are currently using is still functioning. Today I have captured M4-082 through 090 which is on the machine now. If things continue going I will get through at least M4-092 today. It must be noted that I skipped M5-53 to M4-081. The head that was replaced on the Madrid machine 46 years ago won’t work with our worn head, but by the time we reached tape M4-082 the head wear was such that we could lock up on the signal. It is my plan to proceed through to finish out the tapes and by then we will have another head that is currently being repaired (not refurbished) by Videomagnetics. If that head works we will be able to finish LO-IV and start immediately on LO-1. If we get the tapes done today that I think we will we will have 333 tapes to go by the end of the day! 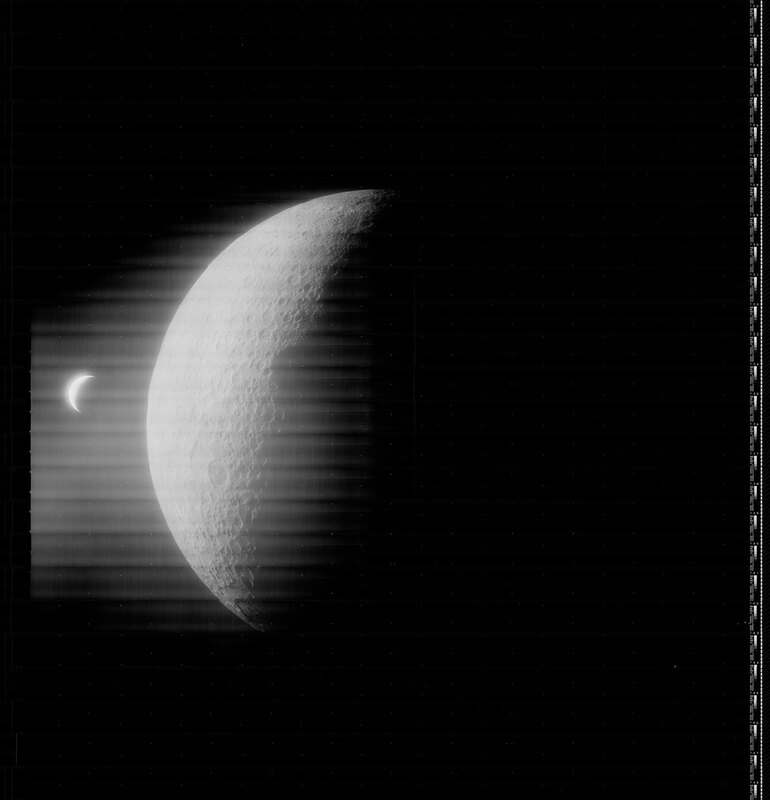 We got the Lunar Orbiter photography book yesterday, sans to critical pages in the table that we use for matching the sequences to the tapes. However, I can still provide the data for the tapes that we are running today in the form that we did for Lunar Orbiter II, III, and V.
If we get through all of these tapes (M4-092 is running now), we will have 332 tapes to go! The head that is on the FR-900 right now has been running for about 150 hours. It’s tip projection is below the recommended minimum for the lunar orbiter tapes. When the Madrid ground station changed their head after M4-52 the machine quit working. After much pain and suffering and scratching of heads Ken and Terry Smith, another old hand figured out that as the tip’s wear down the velocity changes ((pi*r^2)). Due to the fact that the Lunar Orbiter tapes have a signal that must be demodulated accurate to one hertz, this presents a problem. We have quasi proved this by taking tape M4-111, the last tape for Madrid, putting it on the machine, and adjusting the tip penetration out as far as it will go. That tape is playing back. This won’t work for all of the tapes and thus I will now work backward from M4-111 to see how many I can get done…. This is what the public and researchers have seen for the past 47 years (click on image to enlarge). Note that the Earth is over exposed and there is the pronounced characteristic stripping (showing individual framelets) on the lunar surface. 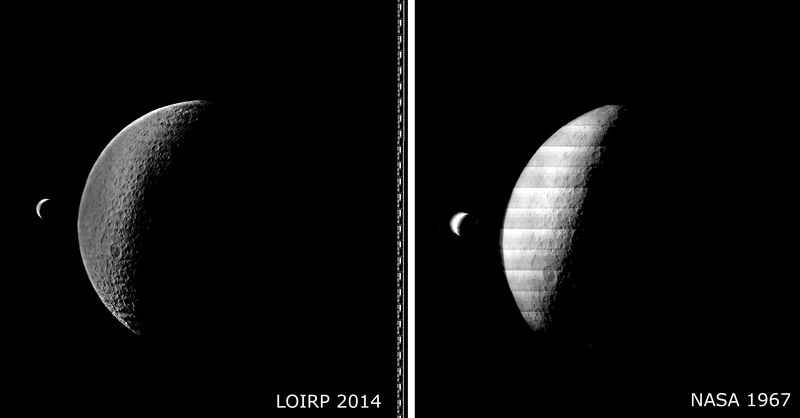 So we downloaded the image and set our imagery genius Austin Epps to work on the image. The image on the left is output of our usual assembly program (click on image to enlarge). 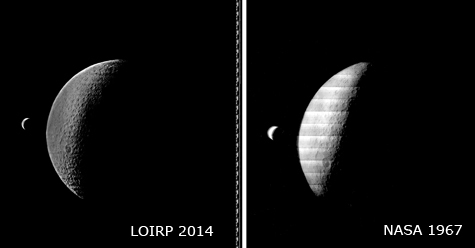 The image on the right is the result after some additional filtering to suppress the overexposure issues that Lunar Orbiter IV was having (click on image to enlarge). There is still some striping as you can see – and addressing that in very high contrast images like this one takes some additional work. 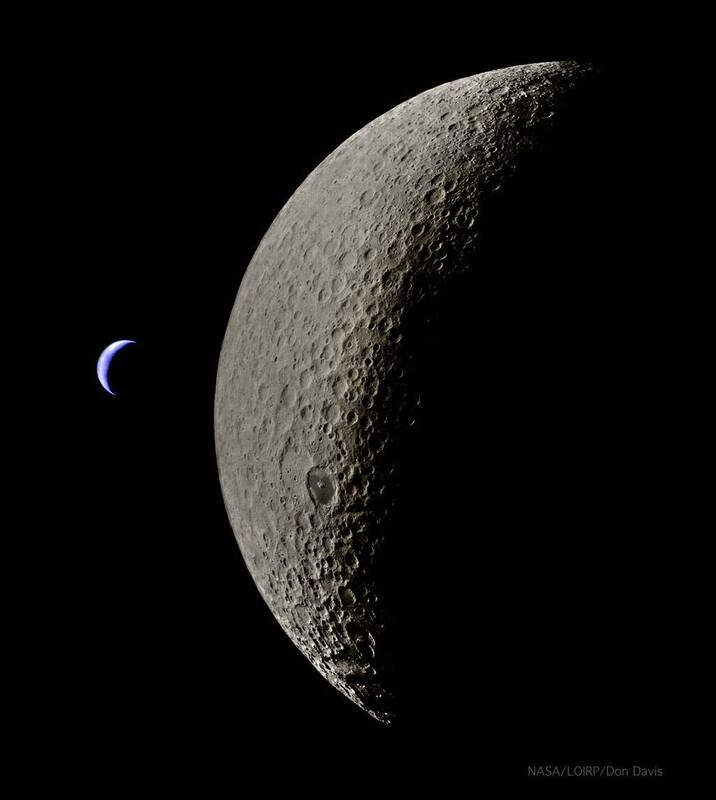 In this image Earth’s limb and terminator have been sharpened and Rousseau markers (as well as other film/readout noise) have been removed from black areas of the image. 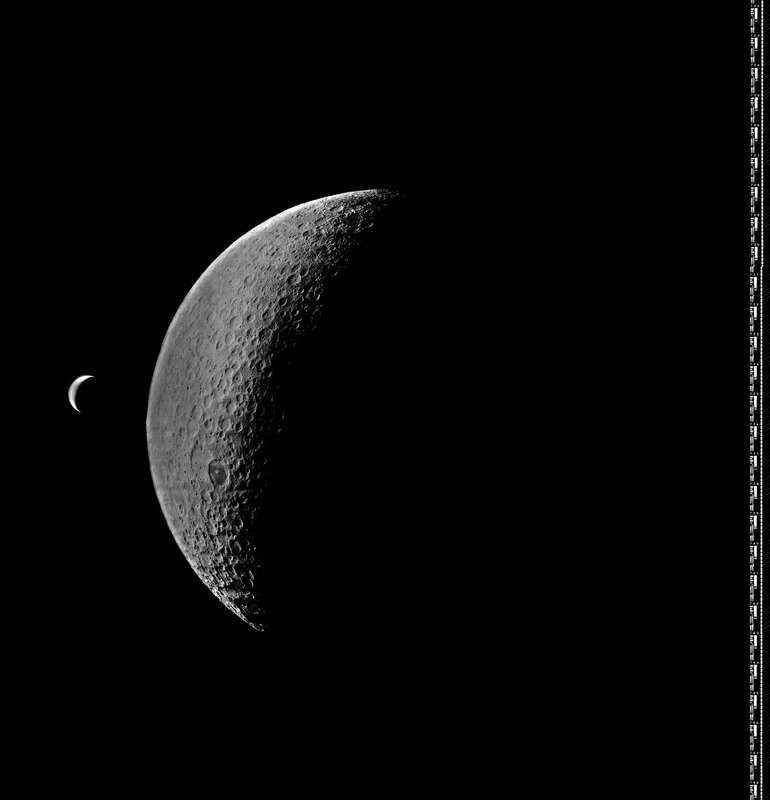 Some additinal filtering was applied to the Moon for additional destriping. Click on the image for a larger view. We completed Madrid tape M4-052 yesterday, which gets us almost half way through the Madrid captures… That’s the good news. The bad news is that the ground station changed heads yesterday and now our head is not working. It was at the end of the day and we will figure out what the changes were on Monday. Dennis Wingo: Status, near end of day, January 16, 2014. A very good day today. 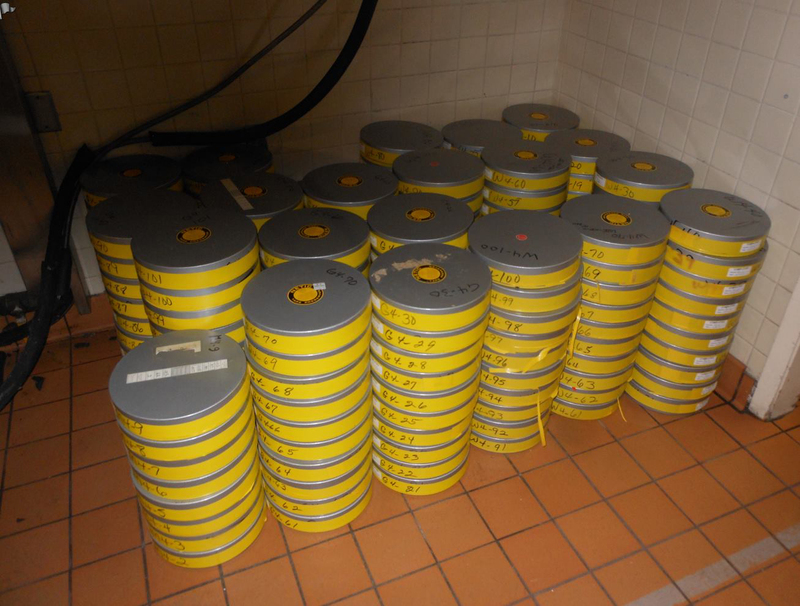 Came in early today and with several of the blank images that we have seen in the other ground station tapes, we have been able to get through a lot of tapes. AT the end of the day today we will finish M4-033! Running M4-032 now and will do one more before I leave. That is 23 tapes today, bringing the number of tapes to go down to 346! Just as an FYI we have 110 Madrid tapes so that is 67 (edit: miscount— 77 to go) tapes to go to finish out Lunar Orbiter IV. If everything holds out, we may finish Lunar Orbiter IV by next Friday. Then on to the final Orbiter, Lunar Orbiter 1!